Action Feature: Change costumes, swap hair, etc. 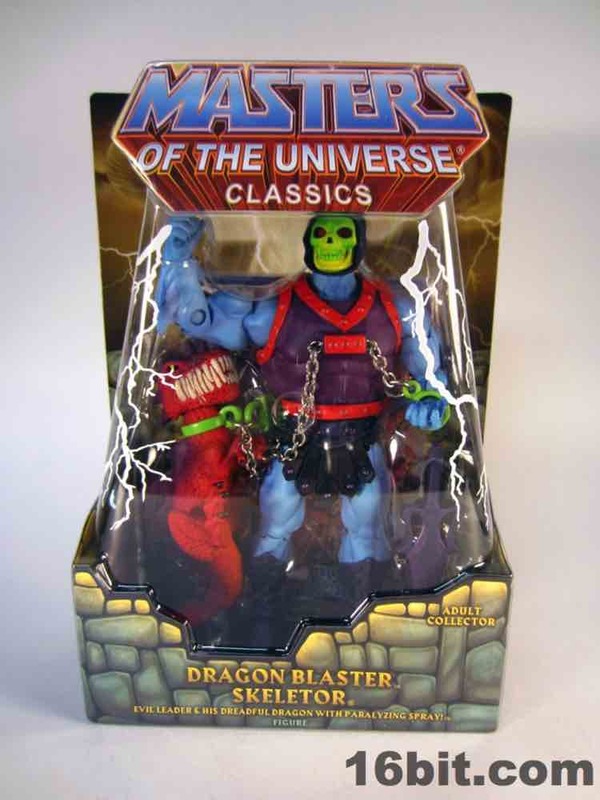 A lot of fans take Masters of the Universe quite seriously, which is unfortunate given how goofier concepts like Dragon Blaster Skeletor are some of the most fun! 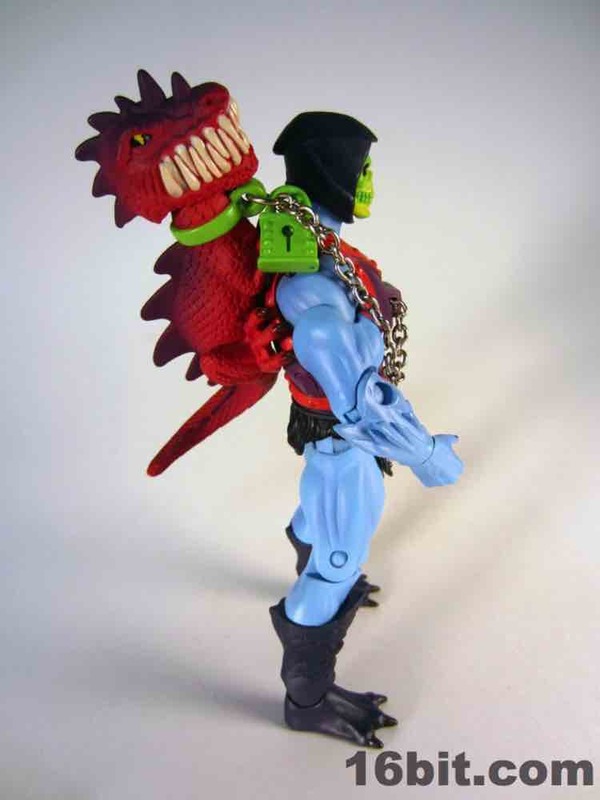 Due to whatever reason someone somewhere hates fun, the little dragon buddy no longer shoots water but instead just sort of sits there on Skeletor's back, looking around with a neon green lock around his neck. 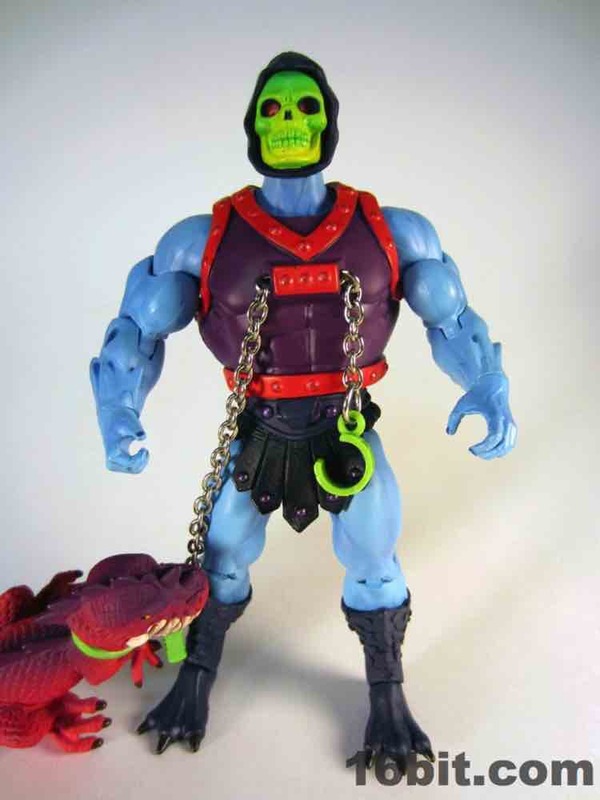 A metal chain connects him to Skeletor's wrist, which is notable in that it's a new wrist. 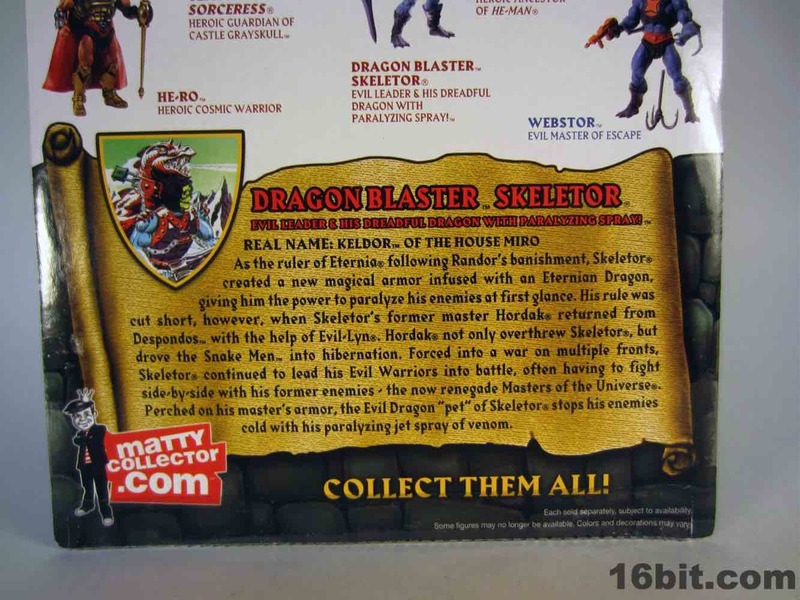 After regular Skeletor, Mo-Larr Skeletor, Battle Armor Skeletor, and other variants, I can honestly say that I'm glad they made Dragon Blaster Skeletor. 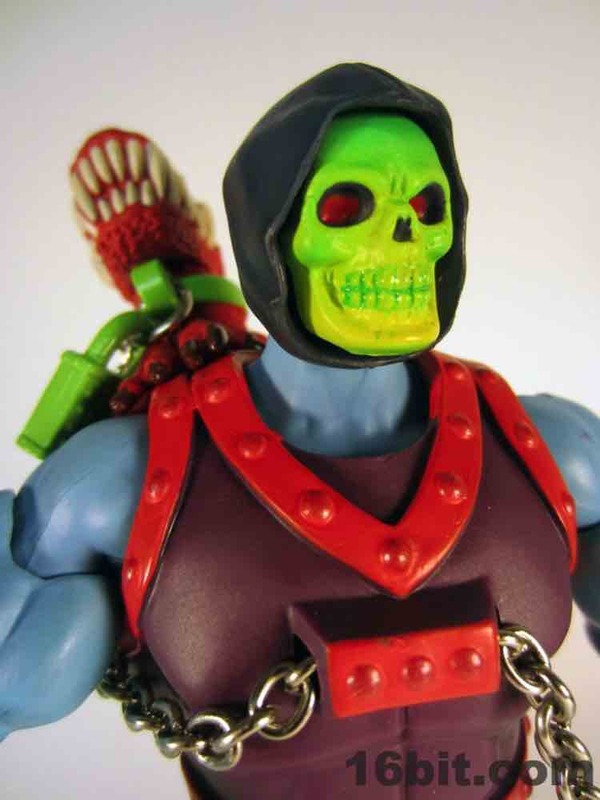 Sure, I may be bitter they sucked the toy element out of it, but it's a good-looking figure with a nice heft to it, it's well-constructed, fairly well decorated, plus it includes a comic. And a dragon. 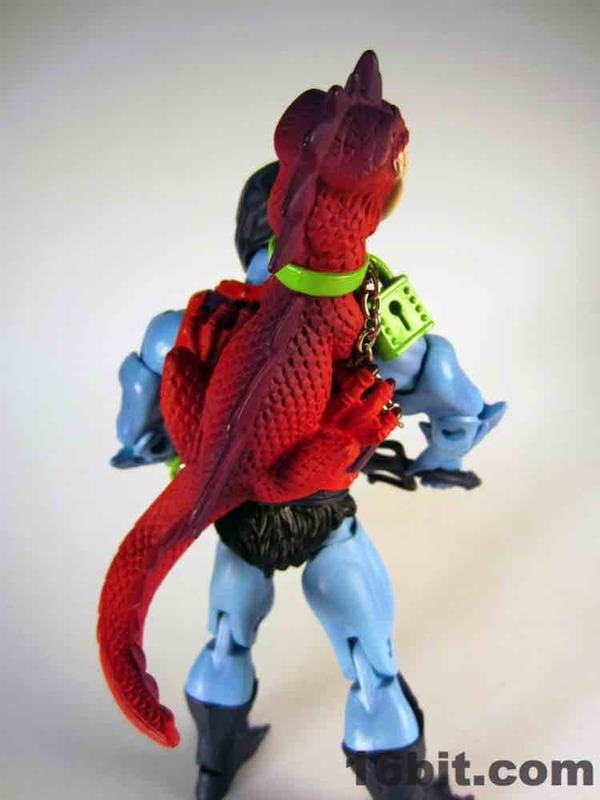 Do you know how many of my other figures have dragon backpacks? None. None many. That's why this one is so gosh darn much fun to have on my desk right now. 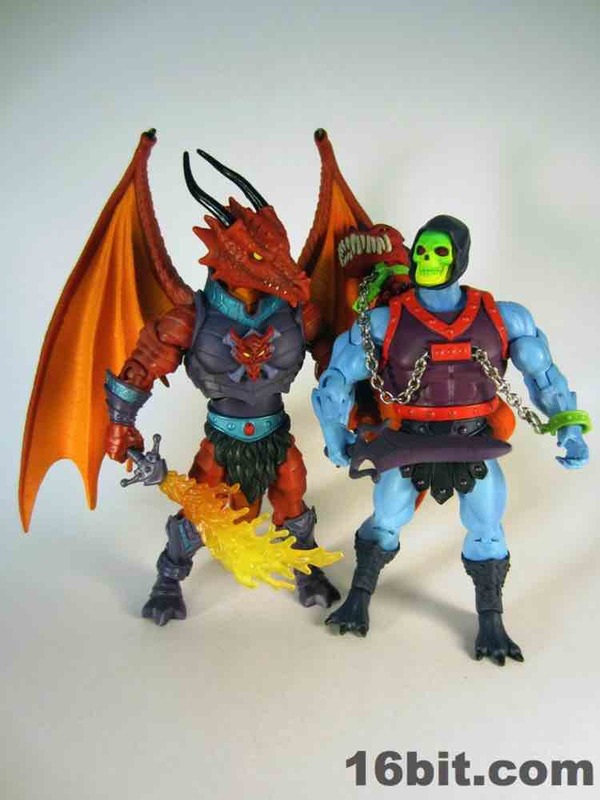 Not content to merely slap on new armor with a dragon buddy on Skeletor's back, the Dragon Blaster Skeletor figure has Kobra Khan's arms and legs giving him an appearance closer to the original action figures, with more subtle, smaller spikes on his wrists and scaley legs. 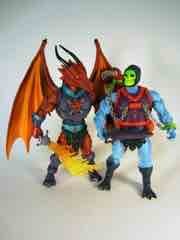 (Previous MOTUC Skeletor figures were based on the cardback art.) Unlike Kobra Khan, this new Skeletor doesn't have oddly-restricted elbow joints. 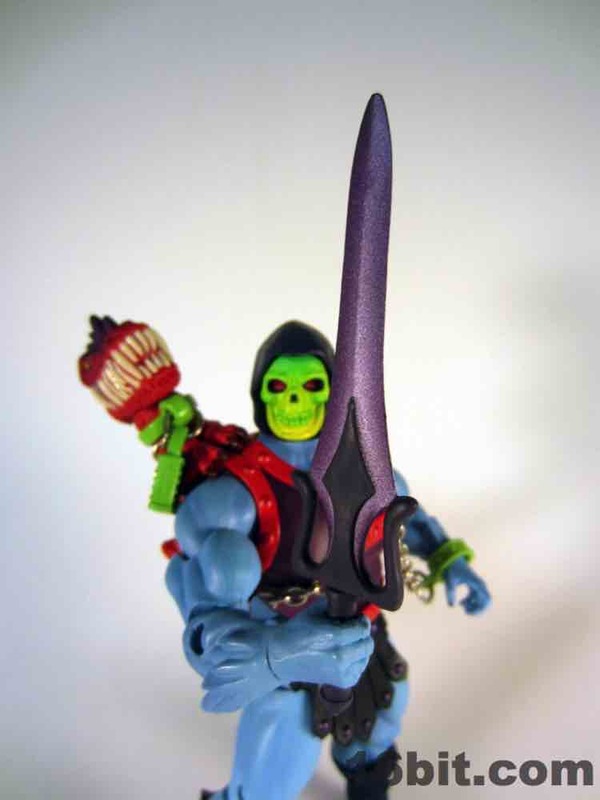 The sculpt is, as usual, quite good and a nice change of pace from the usual "let's give bone-face a new weapon and a new piece of armor" mentality we see with our token annual Skeletor releases. Skeletor's only real flaw is one we've been seeing a bit of this year, and that's in the deco department. 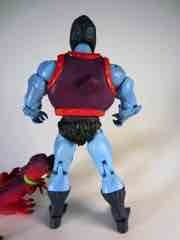 The paint job is exquisite, the layout superb, but if the figure ever gets a scrape or they miss a spot you'll notice. 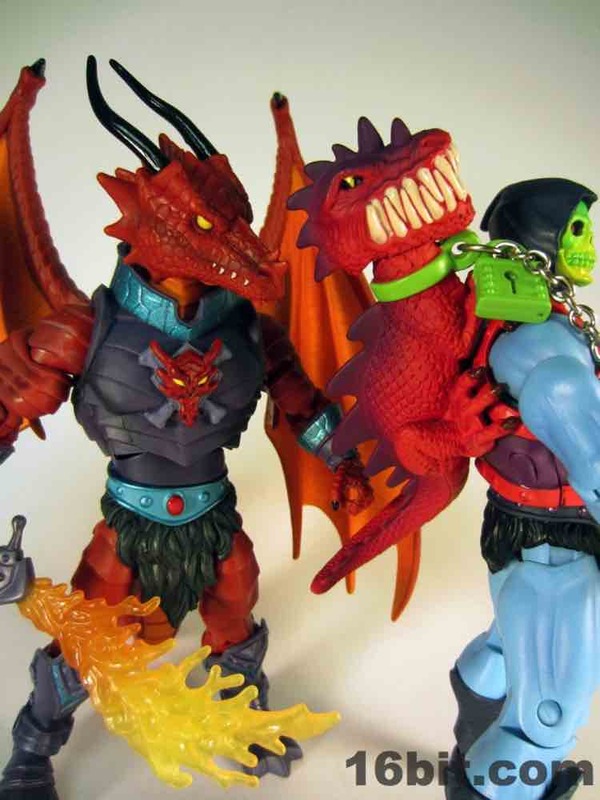 A few figures this year were molded with black plastic bodies and a heavy, heavy paint job to the point where it's almost impossible to tell. That's a quality paint job. 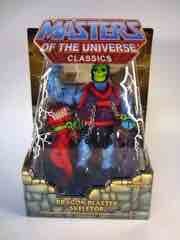 There may be a speck or two where the black plastic shines through, which is, of course, ugly. 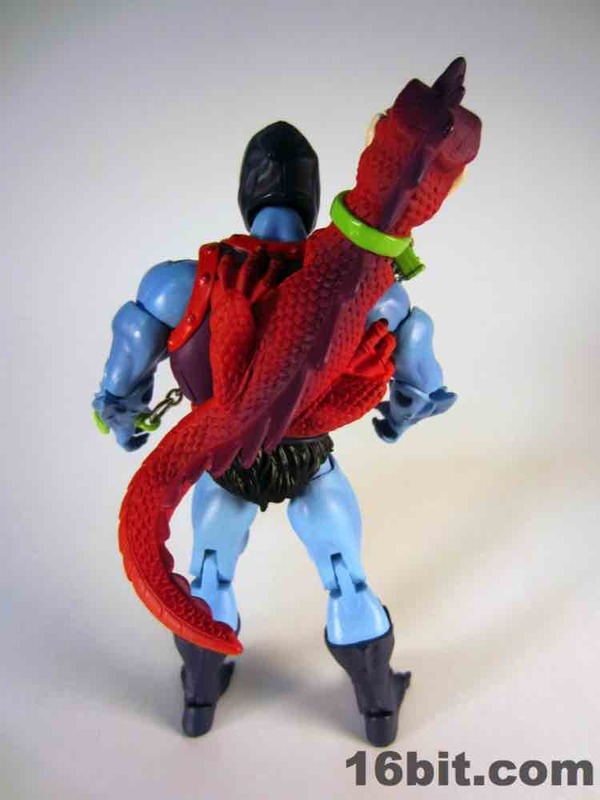 I've seen this on a couple of figures and while I live in a cave and rarely notice these things myself, in proper lighting it's hard to ignore. It's not a fault per se, but it's not ideal. 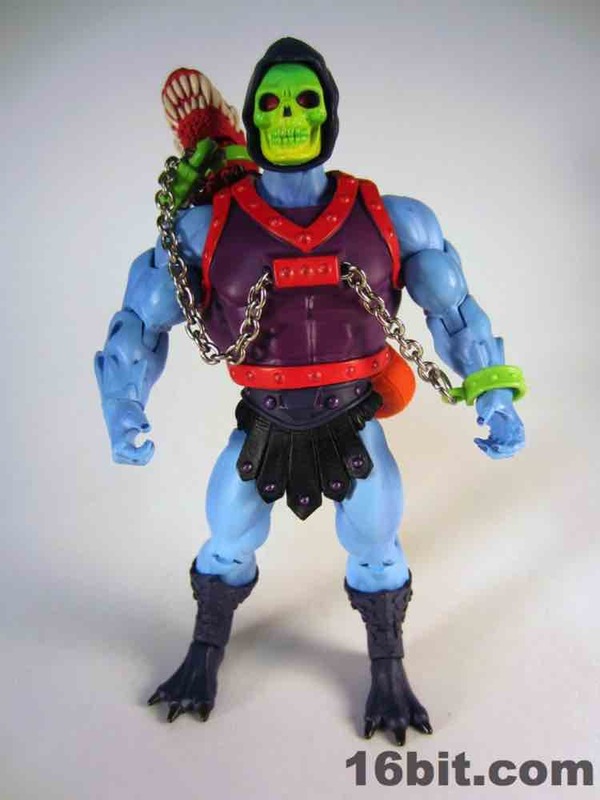 Skeletor still looks great, but it's the kind of thing that makes an A+++ figure into an A/A- figure if the deco is just a smidgen off. 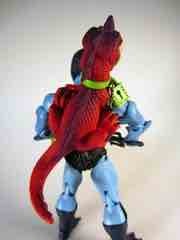 Mine's pretty good, by and large, but it's difficult for any figure, from any manufacturer, to be perfect. I should also note, Skeletor's joints are nice and tight, it seems to be much sturdier than many other figures. 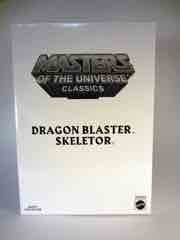 Not that they aren't sturdy, but Dragon Blaster Skeletor feels exceptionally on the ball. Skeletor has three accessories: a sword, a dragon, and a comic. The sword is a basic, purple Power Sword. Not bad, but not much to talk about. It's good. 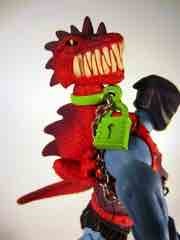 The dragon is nifty, a giant, well-decorated accessory with a single point of articulation. 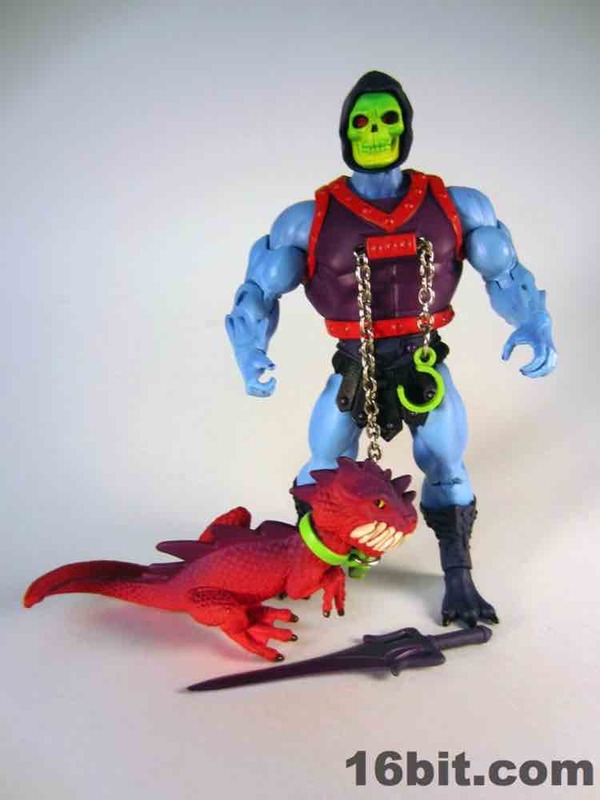 He isn't molded to the armor, although a metal chain running from a bracelet through Skeletor's armor and around the dragon's neck is going to keep him from being easily attached to another figure. 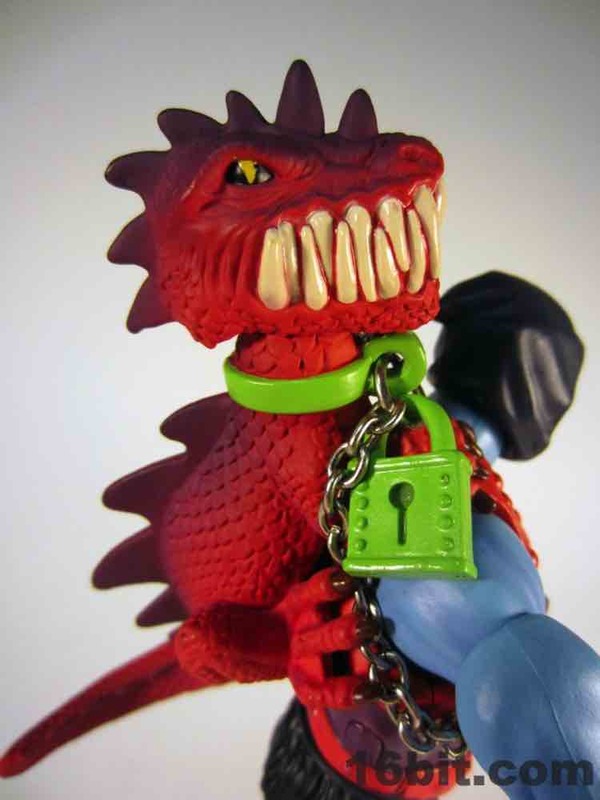 With numerous colors of paint, the dragon comes to life nicely and even with his big, bright white teeth looks like he might be related to Draego-Man. 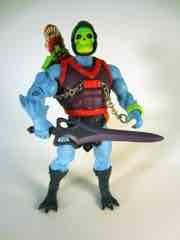 The updated sculpt has a closed mouth, sort of, without the open "O" mouth for squirting water. 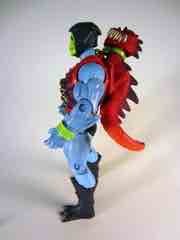 He does, however, have a ball-jointed neck so you could pretty much swap heads with any figure you'd like. I personally don't see why you'd want to do this, but it's always nice to have the option. 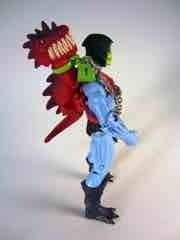 As accessories go it's a big and impressive one, it's just unfortunate that it isn't functional. 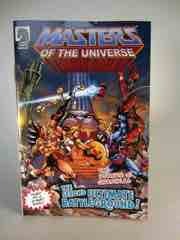 The real gem of the pack for many will be the "Second Ultimate Battleground" Mini-Comic, which features some really amazing, worthy-of-a-poster artwork inside. 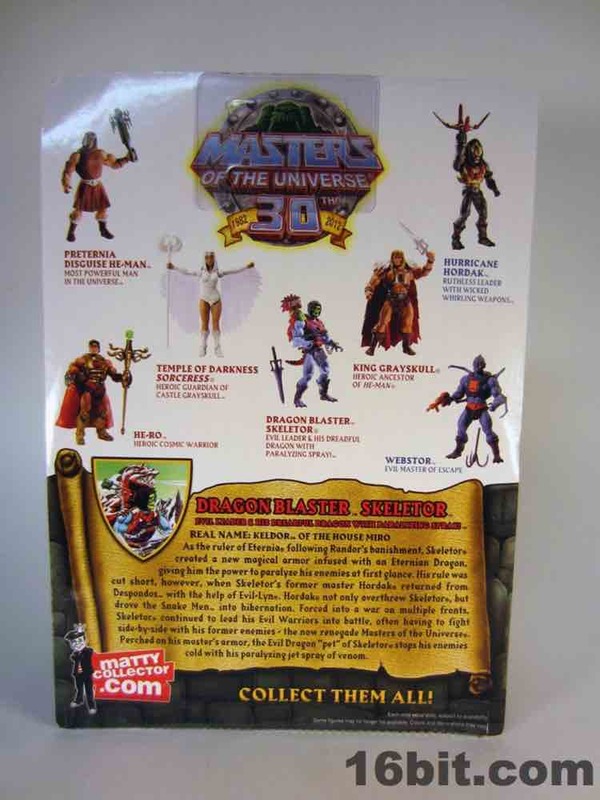 While the opening page isn't much to look at, the following two spreads are insane battle scenes with dozens of characters spanning the entire casts of She-Ra and He-Man's respective toy lines. 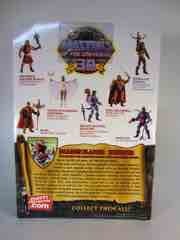 You'll get a glimpse at Cy-Chop, Modulok, yellow Evil-Lyn, Snake Mekaneck, Two-Bad, Lord Dactys, and many others. I mean, it's worth picking this issue up just so you can see all the figures Mattel probably won't be getting to before the line ends. Hopefully they can work out some deal to license the artwork for prints, or at least some nice hi-res desktop wallpapers. Now that the story has wrapped up, it's fun but feels a little incomplete without extensive knowledge of the bios. Even then, it could use a little more meat on the bones as it seems a lot of interesting things probably happened off-panel. 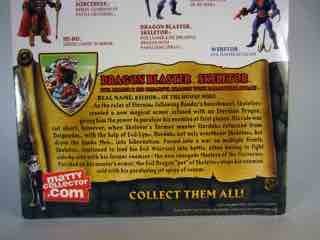 The last page features something sure to delight fans of The New Adventures, so I'll leave it at that. 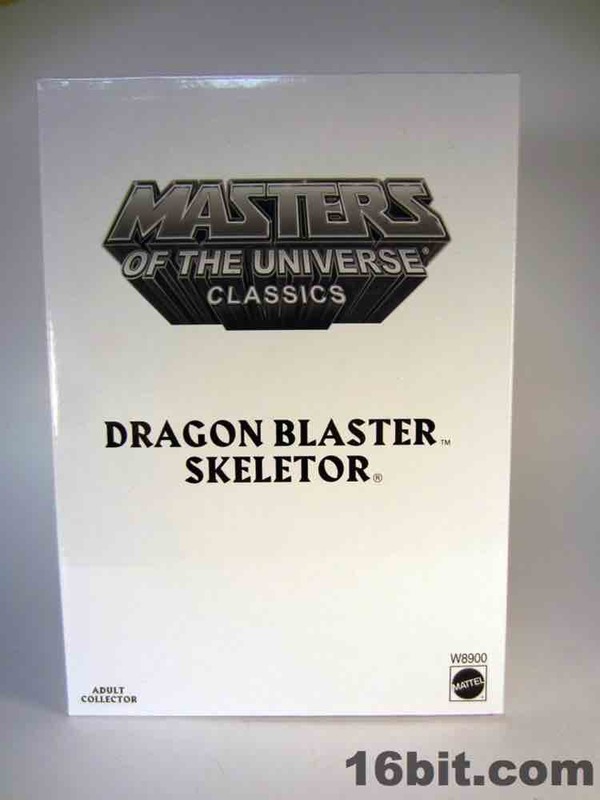 Not knowing how the secondary market will shake out for this line, this feels like a release where, were I forced to overpay for it, I wouldn't complain too much. 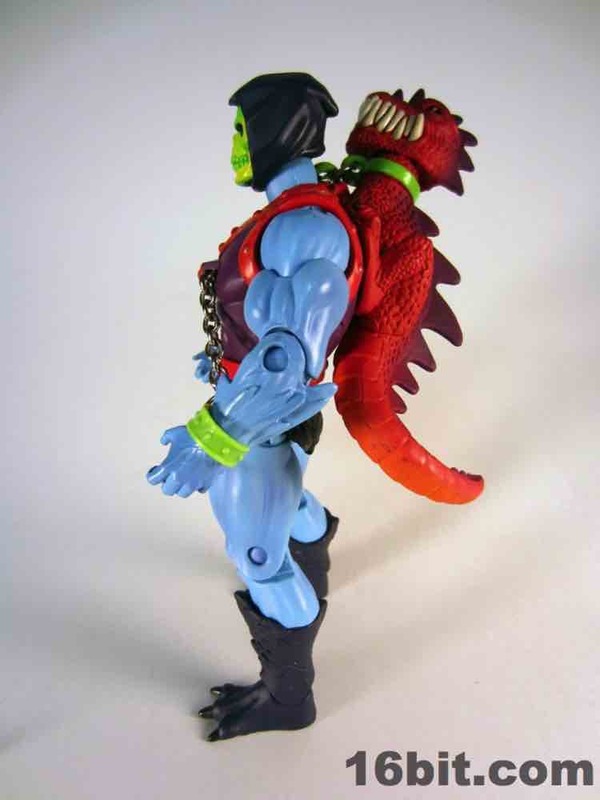 If it cost me $50 for this figure two years down the road... yeah, I could see that. 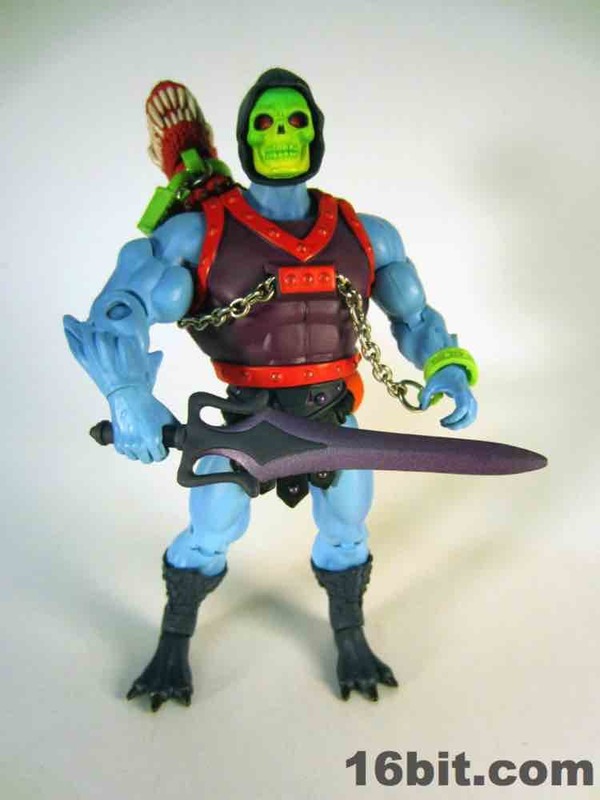 I may not be as excited when it comes time to shell out for Terror Claws or Laser Light Skeletor, but so far I've been pretty happy with what we've got.